Mr Green is a Swedish-owned online casino available in several different languages, including English. There are games from a long row of game developers available in this casino, from big ones such as NetEnt to less well known game studios such as Yggdrasil. In addition to the regular online casino, there is a mobile casino with 60+ games and a live dealer casino with five different table games. Mr Green will give you a 10 free spin no deposit bonus when you sign up, and then bonus on your first 4 (!) deposits. Mr Green is owned by the Swedish company Mr Green & Co through its Maltese subsidiary Mr Green Ltd, and operates with a Maltese gambling license. When you sign-up with Mr Green, you get 10 free spins before making any deposit. You get a 100% bonus up to €100 on your first deposit, and you also get 100 free spins as an extra welcome gift. On your second deposit to Mr Green, you get a 50% bonus up to €50. On your third deposit to Mr Green, you get a 25% bonus up to €100. 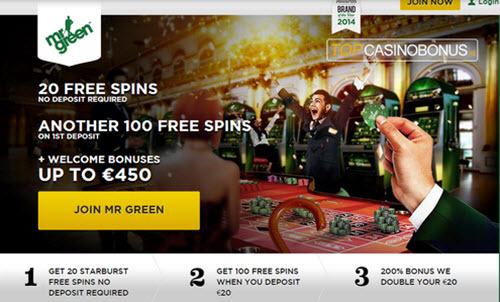 On your fourth deposit to Mr Green, you get a 125% bonus up to €100. Mr Green has a blog that he uptdates frequently. In this blog, various campaigns will be launched, such as contests, give-aways, casino tournaments, and more. Mr Green is especially fond of celebrating new slot games and major holidays. He has become famous for his outrageous contests, such as the one where the winner was sent to Russia to fly in a fighter jet. The game selection includes slots, video poker, table games, scratch cards, instant keno, instant bingo, and more. Some of the games available here are bespoke games developed for Mr Green only. These games are not available in any other casino online or offline. Examples of such games are Mr Green Moonlight, The Marvelous Mr Green, Hamilton, Mr Green Exclusive Blackjack and Mr Green Exclusive Roulette. Hamilton is a slot game based on the fictional Swedish spy Carl Hamilton. Examples of other games (non-bespoke) that are popular among the members of Mr Green Casino are 3 Wheel Roulette, European Blackjack, Mega Fortune, Starburst, Esqueleto Explosivo, Slotfather, Mega Moolah, Dead or Alive, Immortal Romance, Game of Thrones, Foxin’ Wins, and Big Bad Wolf. Mr Green has a mobile casino with over 60 different games. A majority of the games are slots, but other games are available as well, including table games and video poker. Most of the games come from NetEnt and Microgaming. The mobile casino works with both Android and iOS. The live casino at Mr Green is run by Evolution Gaming. Compared to many other online casinos, Mr Green only accept a small selection of transaction methods. This limited selection includes well-known brands such as Neteller, VISA, MasterCard, Click and Buy, Paysafecard and Entropay. Internet bank transfers can be carried out through Trustly. The Mr Green customer support is staffed 24/7.